Spectroscopic experiments have been performed, providing emission and excitation spectra of calcium atoms trapped on argon clusters of average size 2000. The two experimental spectra fall in the vicinity of the calcium resonance line 1S0→1P1at 422.9 nm. The excitation spectrum consists in two bands located on each side of the resonance line of the free calcium. In addition, Monte Carlo calculations, coupled to Diatomics-In-Molecule potentials are employed to simulate the absorption spectrum of a single calcium atom in the environment of a large argon cluster of average size 300. The theoretical absorption spectrum confirms the existence of two bands, and shows that these bands are characteristic of a calcium atom located at the surface of the argon cluster and correspond to the excited 4p orbital of calcium either perpendicular or parallel to the cluster surface. The precise comparison between the shape of the absorption spectrum and that of the fluorescence excitation spectrum shows different intensity ratios. This could suggest the existence of a non adiabatic energy transfer that quenches partly the fluorescence of trapped calcium. Another explanation, although less likely, could be a substantial dependence of the calcium oscillator strength according to the alignment of the calcium excited orbital with respect to the cluster surface. The emission spectrum always shows a band in the red of the resonance line which is assigned to the emission of calcium remaining trapped on the cluster. When exciting the blue band of the excitation spectrum, the emission spectrum shows a second, weak, component that is assigned to calcium atoms ejected from the argon clusters, indicating a competition between ejection and solvation. The European Physical Journal D - Atomic, Molecular and Optical Physics 21(2) (2002) 153. 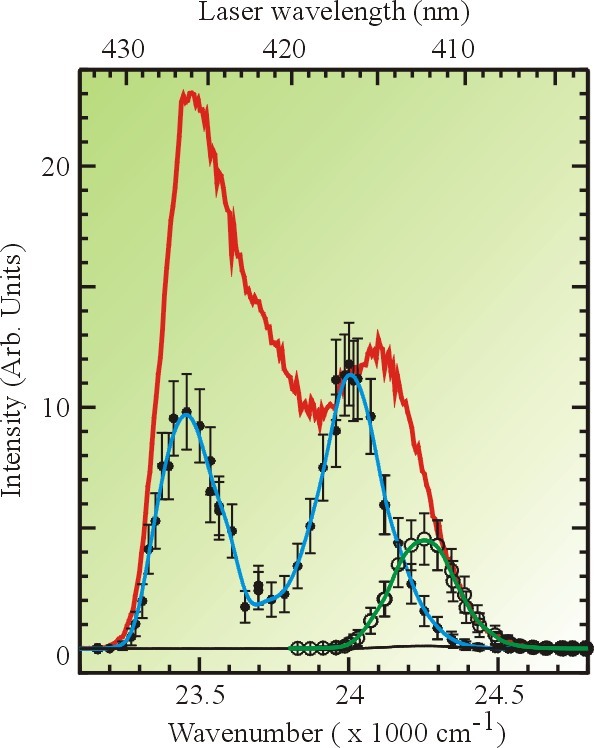 Excitation spectra of the Ca(Ar)n»2000 system. The filled symbols and blue line corresponds to exciting the total fluorescence. The open symbols and green line shows, after multiplication by a factor 50, the spectrum corresponding to excitation of atoms that emits as free Ca(4s4p 1P). The red curve is the simulated absorption spectrum.